Ntopng creates historical timeseries to be visualized in the charts. In order to store timeseries data, ntopng supports RRD and InfluxDB as timeseries drivers. The resolution of data depends on the actual timeseries type. For example, the network interfaces traffic is usually recorded with a 1 second resolution, whereas the hosts L7 protocols data usually have 5 minutes resolution. Moreover, in same cases (e.g. RRD), the resolution of the data depends on how old is the data. RRD is the default driver used. It writes data in the form of local .rrd files. With RRD the retention time for recorded data is fixed 1 year. RRD automatically aggregates old data to save space, reducing its resolution. Ence older data will be aggregated together and finally be removed after 1 year (in fact RRD stands for Round Robin Database). Querying a single data series is efficient since the data is contained into a single file, while performing more conplex queries on multiple data series (e.g. when trying to determinate the top protocols) can take some time. Moreover RRD has shown some limitations when writing a large volume of data, usually leading to gaps in the timeseries data points. With a large volume of data, the use of InfluxDB is suggested. ntopng supports writing and fetching timeseries data from an InfluxDB server. Since database communication happens via the network, the server can also be located into an external host. InfluxDB is really suitable to export high frequency data due to the high insertion throughput. For this reason it’s possible to increase the timeseries resolution to get more detailed historical data. This can be configured from the “L7 Application Resolution” preference. Increasing the timeseries resolution involves more buffering into ntopng. This will have a strong impact on the RAM usage on large networks. It is possible to review the current InfluxDB storage size used by ntopng from the “Runtime Status” page. Moreover, having a lot of timeseries usually means slower query time. Enabling a “Traffic” timeseries usually has little impact on the performance. On the other hand, enabling the “Layer-7 Applications” (in particular for the local hosts) has an high impact since there are many protocols and timeseries must be processed for each of them. It is possible to skip timeseries generation for a particular network interface from the interface settings page. By disabling timeseries generation on a network interface, no timeseries data will be written for the interface itself and for all the local hosts belonging to it. 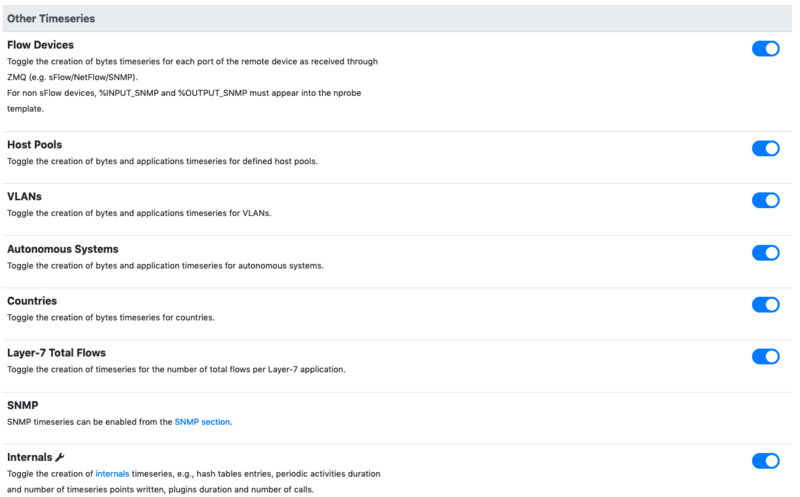 ntopng also provides timeseries on other traffic elements such as Autonomous Systems, Countries, VLANs and so on, which can be enabled independently.